Luke Harper shocked the WWE Universe yesterday when he shared the fact that he had requested his release from WWE, something that was seemingly coming for a long time, but are WWE going to grant his release when he still has seven months left on his contract? 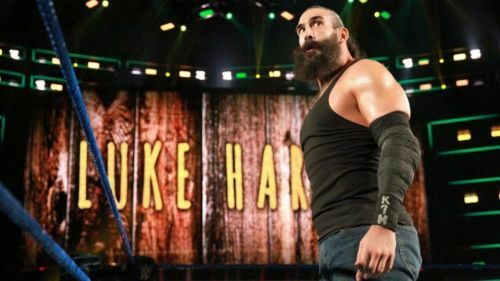 Luke Harper is still awaiting his rematch for the SmackDown Tag Team Championships that he and Erick Rowan were forced to drop back in the summer of 2018, when it was revealed that Rowan was struggling with a bicep injury. Harper has since been kept off WWE TV and only made his return to the company when he was given a spot in the Andre The Giant Memorial Battle Royal at WrestleMania last weekend. He has since been a notable absentee from WWE TV which could be one of the main reasons why his release request was decided. Luke Harper handed in his request release yesterday and The Wrestling Observer, Harper is yet to be granted his release by WWE but it's likely that the former Intercontinental Champion will be granted it. Dave Meltzer also revealed that Luke Harper still had another seven months on his contract since it's not due to expire until November, so the company are under no obligation to take his release request seriously. When his contract does finally expire in November, it appears that the company are well within their rights to add more time on his deal since they can now freeze his contract for the past six months that he has been on the sidelines as well, so this is not a straight forward decision. It was noted that this would be bad PR for the company and it's unlikley that they would reduce themselves to this, but they did once with Rey Mysterio, so it's not completely out of the question. Luke Harper isn't currently in a feud or part of any angles in WWE TV so he could be granted his release at any point in the near future.